The lemongrass used provides a mild citrus taste. Being a native herb of Mexico, lemongrass is a cornerstone in the old Mexican folk medicine where it is said to provide a wide range of benefits including aiding digestion and treatment of high blood pressure. Choosing only the best, freshest and perfectly ripe orange, the juice provides an absolutely delicious taste. And finally blended with aromatic and spicy, ginger which adds a special taste and zest. 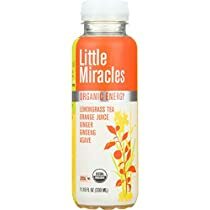 Sweetened with cane sugar and agave this naturally caffeine free Little Miracles is less than 90 calories per bottle. Without any artificial colours or flavours. With a refreshing zest of ginseng, it is the perfect pick-me-up morning, noon or afternoon.